Prepare your students for a successful career as a nursing assistant with this concise text. This easy-to-understand, conversational text focuses on the most essential information that nursing assistants need to know to function competently and compassionately in a long-term care facility, acute care facility, or home health care agency. Each chapter of the new edition has been updated to reflect the latest best practices and advances in the field. NEW! A separate unit on Long-Term Care covers nursing assistant care with residents in long-term care settings. UPDATED! Procedure boxes present 71 core procedures with step-by-step instructions that incorporate the latest guidelines and NNAAP skill revisions. UPDATED! Nurse Pam tips promote compassionate, holistic care and help students empathize with their patients. Guidelines (What You Do/Why You Do it) boxes summarize both the whys and the hows of carrying out key nursing assistant actions. Tell the Nurse! Notes summarize observations that the nursing assistant needs to report to the nurse. Stop and Think! Scenarios encourage students to solve real world problems in the types of complex situations they will encounter in the workplace. Online videos featuring eight hours of engaging footage offer complete, step-by-step demonstrations of the core skills performed daily by nursing assistants. An accompanying Workbook follows the same straightforward organization as the 4th Edition Textbook. Activities include multiple-choice, fill-in-the-blanks, think about it, and matching questions, as well as crossword puzzles, word jumbles, labeling, sequencing, and identification. Huntsville, Pamela immediately began a career as a perioperative nurse. Over the course of her nursing career, she also worked in a physician’s office and as a staff nurse in an intensive care unit. Pamela started teaching informally while serving as an officer in the United States Air Force Nurse Corps. She formally entered the field of health care education by accepting a position at the Athens Area Technical Institute in Athens, Georgia, where she taught surgical technology. After obtaining a master’s degree in adult vocational education from the University of Georgia, Pamela moved to Florida and took a position teaching nursing assisting students. She continued teaching nursing assisting after accepting a position at Davis Applied Technology College in Kaysville, Utah. During her first year at Davis Applied Technology College, Pamela piloted a new “open-entry/open-exit” method of curriculum delivery for the nursing assistant program at the college and was awarded the Superintendent’s Award for Outstanding Faculty for her work. She then opened a surgical technology program at the college and has obtained national accreditation from the Commission on Accreditation of Allied Health Education Programs (CAAHEP) for delivery of this program using the “open-entry/open-exit” method. In 2002,and again in 2014 and 2015, Pamela received a National Merit Award for having her program rank in the top 10% in the nation for students passing their national certification exam. 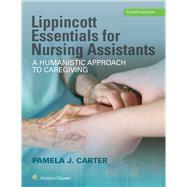 In addition to authoring this textbook, Pamela has also authored Lippincott’s Textbook for Nursing Assistants, “Lippincott’s Textbook for Long-Term Care Nursing Assistants,” as well as Lippincott’s Advanced Skills for Nursing Assistants. Pamela’s writing style reflects her love of teaching, and of nursing. She is grateful for the opportunity teaching and writing have afforded her to share her experience and knowledge with those just entering the health care profession, and to help those who are new to the profession to see how they can have a profound effect on the lives of others. How is the Body Organized?